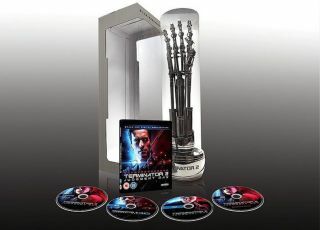 Buy 'Terminator 2' UHD Blu-ray, get life-sized robot arm | What Hi-Fi? The life-sized, robotic arm comes with the 4K HDR Blu-ray release of Terminator 2: Judgement Day and is signed by director James Cameron. But the reason we're focusing on Terminator 2: Judgement Day is because it's soon to be available as a 4K HDR Blu-ray complete with life-sized T-800 endoskeleton arm signed by director James Cameron. UK pricing is yet to be confirmed, but in the U.S. you're looking at $175. Only 6000 will be produced but, if you'd rather skip on the robotic appendage, you can pick up a normal edition of the UHD Blu-ray for £20, which will include both the UHD Blu-ray and the HD Blu-ray. If you are picking one up, why not grab a mechanical skull amplifier while you're at it?